NAVC 'New Product Gallery' Showcases Shor-Line Twice! We were excited to learn that not one, but two Shor-Line products were selected! Our new K9-W8 Scale and Rotational Lift Table (RLT) were presented in the backlit, 8' tall gallery wall. Both the Marriott and Gaylord featured these walls. We hope you were able to make your way to our booth during the show and see our products in use.If by chance you missed them. Check them out at WVC, February 19-23, 2012. “We are delighted to be the first veterinary conference to show this impressive collection of new drugs and devices,” said NAVC Executive Director Colin Burrows, BVetMed, PhD, DACVIM, HonFRCVS. The NAVC had a great concept and we are proud to have been chosen to participate with both the K9-W8 Scale and the Rotational Lift Table (RLT). Thank you NAVC. 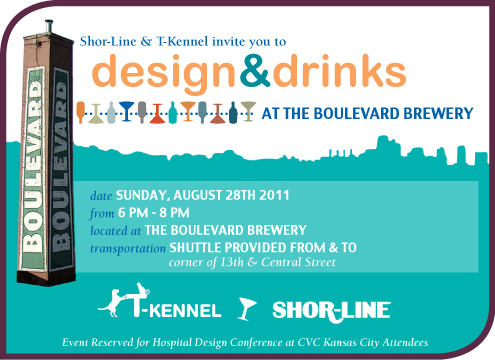 Join Shor-Line for Design & Drinks! We are pleased to invite you to Design & Drinks! We are anxiously awaiting your arrival at the Hospital Design Conference at CVC Kansas City! There are many great topics at this year's conference and to keep the inspiration alive we are hosting the Design & Drinks event to provide you the opportunty to mingle with leading industry architects and experienced Shor-Line representatives. We know that designing a new facility or remodeling an existing one is an exciting and challenging time. Ask all the questions you desire and get to know your Shor-Line representative in a relaxed atmosphere. Enjoy KC's finest brews and a beautiful skyline. Stop by our Hospital Design Booth #103 to receive your formal invitation and gift. Save the date and get on the list here. Design & Drinks takes place two hours before the Josh Turner Concert hosted by CVC at Kansas City. Transportation is provided to and from the Design & Drinks event. Event reserved for Hospital Design Conference at CVC KC attendees. If you attended the NAVC last month you were the first in the industry to experience the Blue-Line. Wondering what Blue-Line is? Blue-Line the newest family of premium Shor-Line products designed to provide streamlined functionality and exemplify true sophistication. 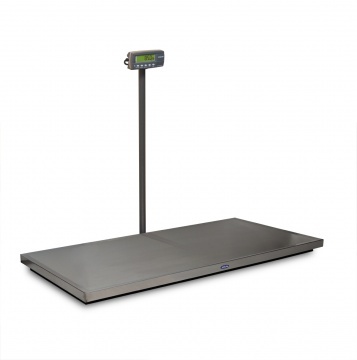 Featuring a Rotational Lift Table (RLT), a series of Fold-Up Wall Mount Tables, Scales and additional products. If you missed it, don't fret! You can catch them at WVC this upcoming week. Visit our booth #1133. This line is pure innovation. Blue-Line is a family of stylish premium products providing multiple product features to enhance any facility and a splash of sophisticated color to brighten anyone's day! Featuring the Blue-Line Table Top at the center of attention. 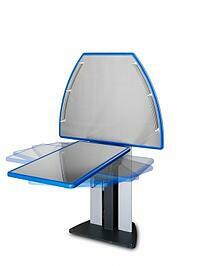 This table top's coated edge is durable and its radiused corners are accompanied by safety. All the while benefiting from the durability of the stainless steel embedded surface. Best of all, this line exudes quality. Imagine your clients walking into your facility: seeing a warm welcoming staff, a clean well-maintained environment and a splash of color versus the cold sterile look of just stainless can project. The sleek lines of color help the client navigate through the facility while you and your staff are utilizing the industries top-of-the-line new premium products offered only by Shor-Line. That is the Blue-Line Experience. Welcome to our blog and happy 2011! Shor-Line is excited to venture on this journey with you into the blogosphere and share valuable information about our products, services and the latest industry trends. As you may know, for 84 years, Shor-Line has maintained a business philosophy dedicated to quality products and service. As an animal health industry innovator, we are constantly reinventing and adding to an extensive array of products to help professionals, like yourself, provide the best possible care for their patients. Our continuing research and development, field-testing, quality control and open dialog with professionals worldwide enable us to provide equipment of superior quality. Fresh off the press, our 2011 Product Catalog will be debuting this week and with it many new products. At NAVC this month we will be unleashing a new family of premium products that will be sure to inspire you! Stop by our Booth #1301 and check them out. They will be live on our website soon! As many of you might have New Year's resolutions, in 2011 Shor-Line plans to enhance your product experience by unleashing new products, reinventing established products and engaging in industry conversations. We invite you to join us on this journey and rediscover quality.